The "Marienbad Elegy" is a poem by Johann Wolfgang von Goethe. It is named after the spa town of Marienbad (now Mariánské Lázně) where Goethe, 73 years old, spent the summer of 1821. There he fell in love with the 17-year-old Ulrike von Levetzow. Goethe returned to Marienbad in the summer of 1823 to celebrate his birthday. 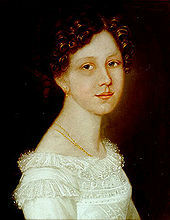 On that occasion, he asked Ulrike, via his friend, Karl August, Grand Duke of Saxe-Weimar-Eisenach, to marry him. She declined. This poem, considered one of Goethe's finest and most personal, reflects the devastating sadness the poet felt when his proposal for marriage was declined. He started writing the poem on 5 September 1823 in a coach which carried him from Eger (now Cheb) to Weimar and by his arrival on 12 September, it was finished. He showed it only to his closest friends. Sie trennen mich, und richten mich zugrunde. Deserted me, and hurl'd me to the ground. Goethe never returned to Bohemia. He died in Weimar in 1832. ^ Liukkonen, Petri. "Goethe". Books and Writers (kirjasto.sci.fi). Finland: Kuusankoski Public Library. Archived from the original on 6 August 2008. ^ Johann Wolfgang von Goethe, Stanley (1999). 103 Great Poems: A Dual-language Book. Translated by Appelbaum. Courier Corporation. p. xxiv. ISBN 0486406679. 'Marienbad Elegy' [...] has been called Goethe's greatest poem. This page was last edited on 31 December 2018, at 08:16 (UTC).